Addition of lithium aluminum hydride to esters leads to the formation of primary alcohols (after addition of acid). When treated with lithium aluminum hydride abbreviated LAH, esters are reduced to yield primary alcohols. As well as most mechanisms of reduction with LAH (reduction of aldehydes, ketones, carboxylic acids, amines), this process is somewhat complex, so that a simpler version will be shown. This reaction involves two equivalents of LAH. The first equivalent of LAH reduces the ester to an aldehyde and the second equivalent of LAH reduces the aldehyde to an alcohol. But with only one equivalent is not possible to produce aldehyde because aldehydes are more reactive than esters and will react with LAH immediately after being formed. For this purpose, DiBAl-H is used. Hydride ion of LAH attacks the carbonyl group and makes methoxide ion a good leaving group that is expelled in the next step. This re-forming a carbonyl group gives the aldehyde as an intermediate. Then this whole procedure is repeated. The second molecule of LAH is used to function as a nucleophile (its hydride ion) and attacks the carbonyl group. 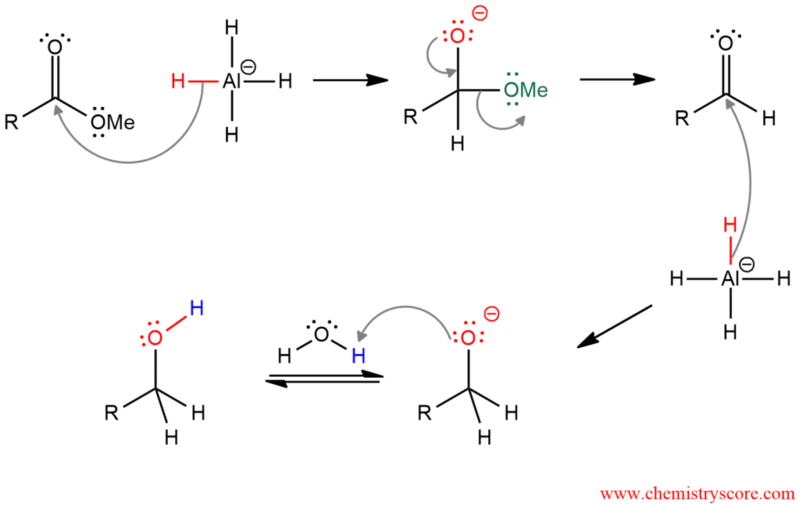 After the reaction is complete, the alkoxide ion is protonated with an acid (water in this case).